Having worked in social media since graduating from college in 2009, I picked up a few internet friends along the way. 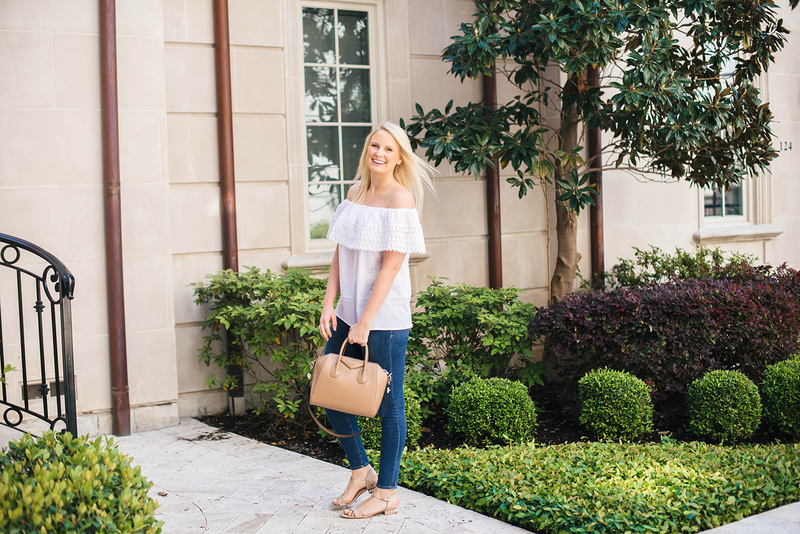 For example, there are so many style bloggers I haven’t met in real life, but we all communicate so frequently on Instagram or Twitter that it feels like we’ve known each other forever! One of my earliest Twitter friends recently started her own clothing line, Paloma El Paso. 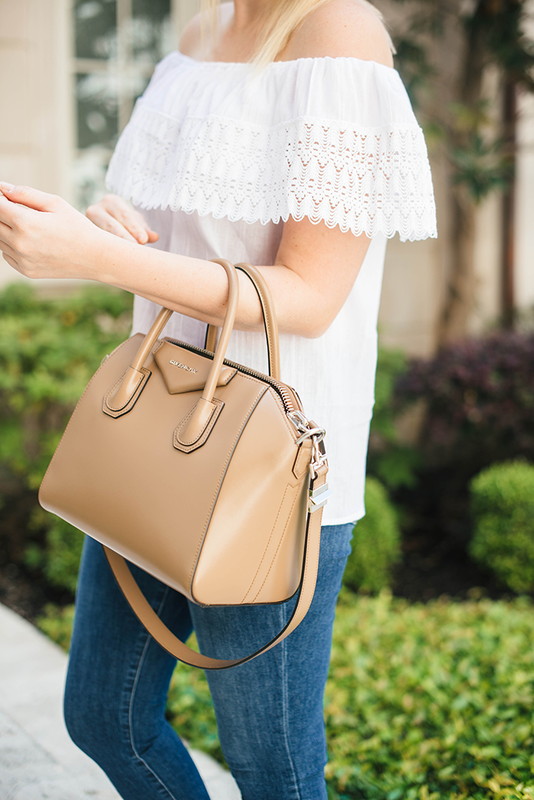 All of the pieces are so soft and breezy, perfect for hot Texas summers! The Olivia blouse (featured here) is 100% cotton and was made in Oaxaca using traditional weaving methods. The fabric is light and the silhouette is effortless and chic. It’s just the kind of piece I like to wear all summer long. Click here to discover Paloma El Paso and shop Megan’s amazing pieces! Also, how cute are these sandals?! I picked these up while I was in New York a couple weeks back. All of my weddings this year are outside on grass or on the beach, so a stiletto heel just isn’t gonna cut it, and I’m not the biggest fan of wedges. The short, block heel on these is so minimal you’re practically wearing flats! Plus the pearl detail and glittering give these sandals the perfect dressy touch, don’t you think? What’s great though, it how amazing they look with even the simplest, casual outfits like this one. Talk about a versatile shoe! These sandals are a stunner, love them! What a perfectly pulled together outfit. Those sandals are stunning! Swoon. Merritt! You look so naturally gorg & glowy. This is such a gorgeous blouse and I will absolutely be checking out Megan’s shop. You are a darling & classy model that is for sure. Love your bag too! LOVE this top! 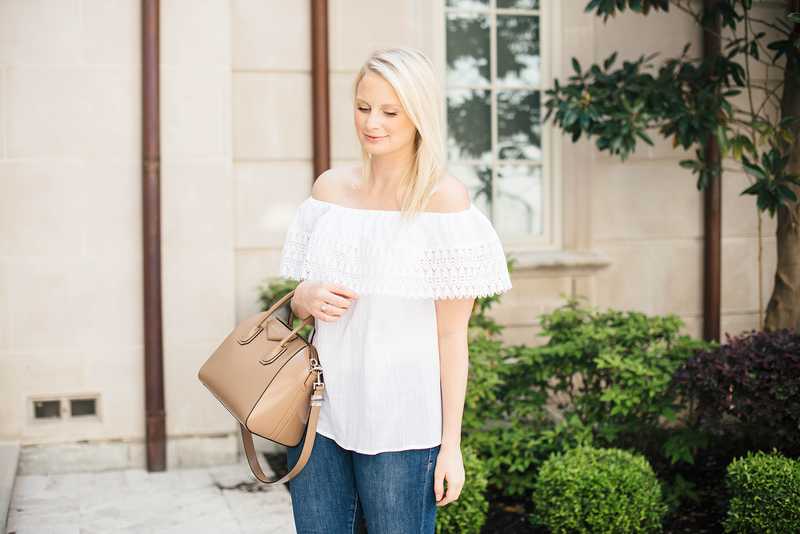 The lace detail and the off the shoulder style is total perfection! Thanks for introducing us to this collection! Seeing so much white lace and eyelet this spring. I love it! I’ve been obsessing over these sandals since you shared them on snap! Sooooo cute! Love this outfit! Does the shirt run big? That top is so beautiful and oh that bag! Love the shoes & shirt! Those sandals are perfect. I adore the pearl details. I wish I had them! Oh wow, this is all so gorgeous, especially the top and your shoes! Your pics are so nice, perfect with your smile! Such a pretty top! Love it.